Are Slider Replacement Windows A Good Fit? Vinyl Or Wood Replacement Windows? Everyone wants their home to look nice and feel even better and when the time comes for Midland, ON replacement windows, that matters even more. As you approach the process, you’ll have a lot on your mind. You want quality, but you have to find something affordable. You also want a style you love, but one that will withstand the test of time and not go off-trend in the next few years. You can customize any window style you like, but you have to settle on a style first. Let’s take a look at a few of the most popular replacement window styles to help you make big decisions with ease. Casement windows are classic and functional. They are also highly affordable as far as window styles go. These windows feature one sash on a hinge that swings out away from your home. They are great for ventilation and can catch the breeze and bring the fresh air into your house. They also operate smoothly and are the most energy efficient operating window on the market. The crank handle operation often folds into the window, so it is out of the way between uses as well. Double hung windows are something that have been popular for many years and they remain a popular option today. They aren’t something that ever goes out of style so that makes them a great option. They are also highly versatile because while they have a traditional style, they fit into modern homes as well. You don’t have to worry about your house looking like every other house just because you choose these windows. Double hung windows have two sashes that slide up and down. You can open just the bottom, just the top, or both. Their design is great for families with young children and they tilt into the house for easy cleaning as well. Awning windows don’t work in every room, but they thrive in certain situations. These windows are like casement windows, only flipped. They hinge open upward and away from the home with a crank handle. The unique style provides ventilation throughout the year, even in the rain. They are their own protection from rainfall and allow you to feel the breeze whenever you need it. They work well in basements or around picture windows if you want the large view, but also the ventilation. There are plenty of other Midland, ON replacement windows to consider and unless you’re set on a particular style, you’re better off exploring all of the options until you find just the right choice. Keep in mind that you don’t have to choose just one style, either. You can mix and match the styles based on the room and what it needs. 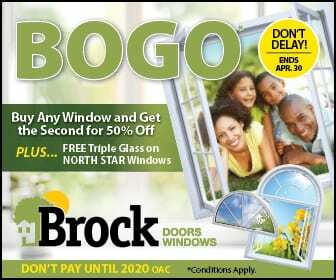 When you’re looking for help, contact Brock Doors and Windows Ltd. by calling (800) 449-3808 for a free consultation. You can also visit us and look through the styles at 2347 Industrial Park Rd Innisfil, ON L9S 3V9.